A lot of people usually complain that they find it difficult to eat breakfast because of the time required to prepare it. If you wake up 5.am in other for you to beat traffic, so you can get to work on time, Then I completely agree with you that it can be difficult to wake up to prepare a meal to eat for breakfast. But you know as well that if you are HIGHLY serious about losing weight, you need to eat breakfast too. 3. Rejuvenates your organ and make it work at optimum. So, if you always have to rush out of the house in the morning and find it hard to eat breakfast, You should consider making “smoothies”. It’s easy to make and you can take it with you to work to drink at work too. 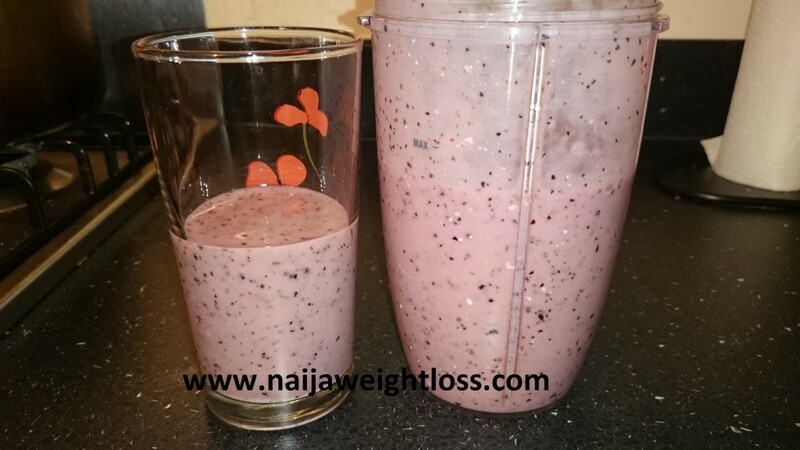 My wife has taken a liking for making smoothies too after seeing how delicious mine looks and taste like. 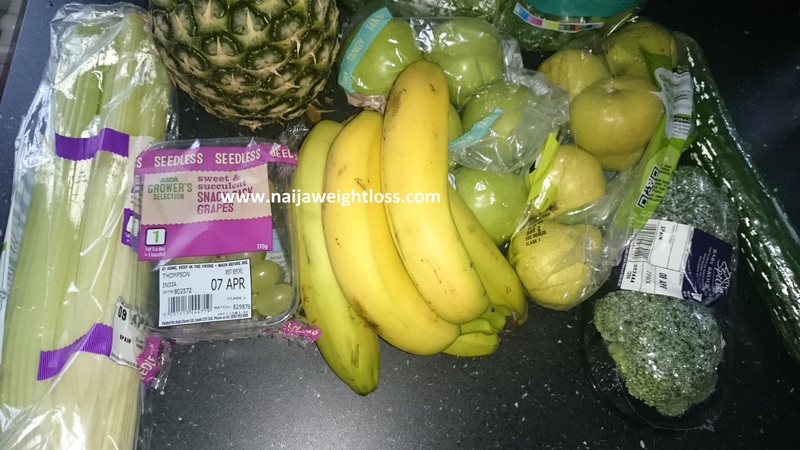 Now, I know most of these Smoothies Ingredients above are very scarce and can be very expensive in Nigeria. 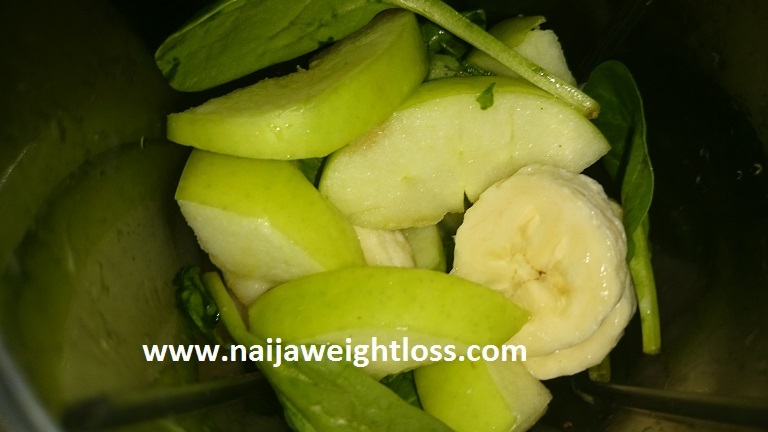 So I want to show you how to make a quick delicious Green Smoothie With Local Nigerian Fruits And Vegetables. 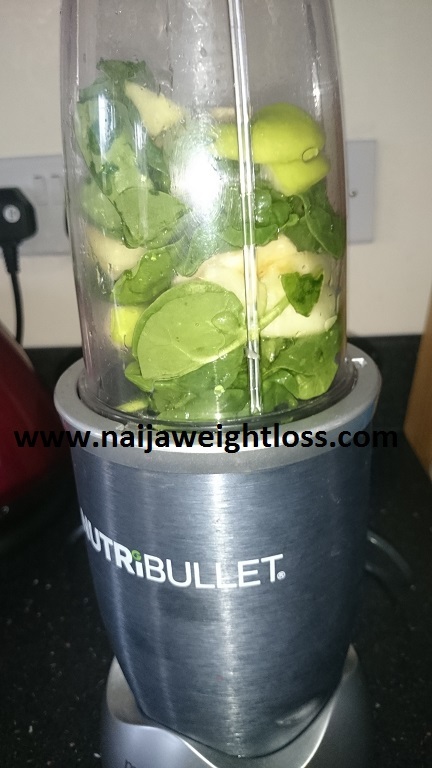 Put the Ugu/spinach, apple and banana in your blender cup. Then add a little water to it to allow it blend with smoothness. 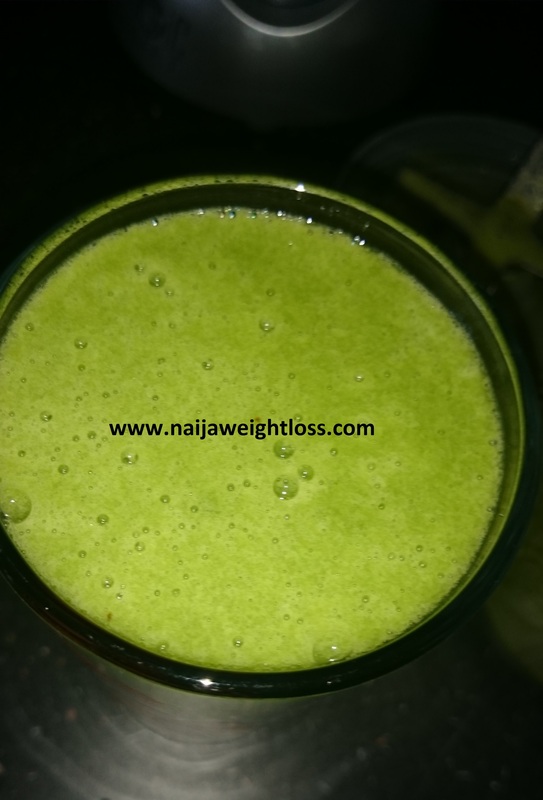 Blend for 2-3 minutes until its very smooth using your blender, juicer etc.Personally I use a Nutribullet, but you can use a blender or Juicer of your choice. Pour into a cup or bottle and put ice to make it have a refreshing cool taste. Here’s what the picture looks like after making mine and I want to encourage you to do exactly the same too. NOTE: The sweetness in the apple will erase the “bitter” taste associated with Ugu or Spinach, and trust me, this smoothie taste really good. You can add a little bit of chopped pineapple if you want to increase the sweetness. This is allowed. 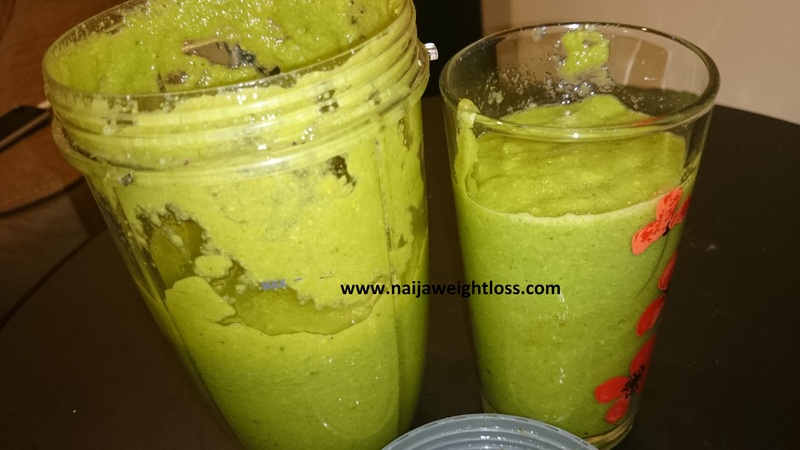 So try this smoothie, and add it to your list of what you’ll take as breakfast in the morning, to help you lose weight. And if you want to lose between 10-20 kg of fat from your body starting this month, I want to encourage you to sign up for my Slim Down In 8 Weeks Program. When you sign up for the Slim Down In 8 Weeks Program and you start using it….You’ll end up with a slimmer body and a flatter belly that you can rock in a fitted dress. You’ll be incredibly happy to take as many FULL pictures of yourself rocking the dresses you like. And you’ll feel very healthy, fit and full of life because your health will improve from the inside out. And this can happen to you if you take your weight loss seriously in this new month. So sign up below. Slim Down In 8 Weeks Program Today.